Ten months ago, the government of Bashar al-Assad launched a horrific Sarin gas attack that killed over 1,000 civilians on the outskirts of Damascus. The August 21 attack prompted the United States and Russia to strike an agreement that put into motion an expeditious plan for accounting, inspection, control, and elimination of Syria's deadly arsenal under the auspices of the Organization for the Prohibition of Chemical Weapons (OPCW). Today, OPCW Director-General Ahmet Üzümcü announced that the last of the remaining chemical weapons and precursors identified for removal from Syria were loaded aboard the Danish ship Ark Futura at the port of Latakia in Syria. This is a major milestone that will help protect Syria's beleaguered and battered population from further, large scale chemical weapons attacks from the Assad regime. To its great credit, the OPCW, the United Nations, the United States, Russia, and a diverse coalition of more than two-dozen states stepped up to the unprecedented task of verifiably removing a country's entire chemical weapons stockpile under tight deadlines and war-time conditions. The risk of further large-scale chemical weapons use against Syria's people has been severely reduced, as the means for the rapid weaponization of Syria's chemical precursors and agents have been verifiably destroyed. The OPCW-UN Syrian chemical weapons removal mission is unprecedented and has been far more successful in destroying the stockpile and protecting the Syrian people than the alternative contemplated in September: U.S. cruise missile strikes against chemical weapons targets. The MV Cape Ray at Portsmouth, Virginia. 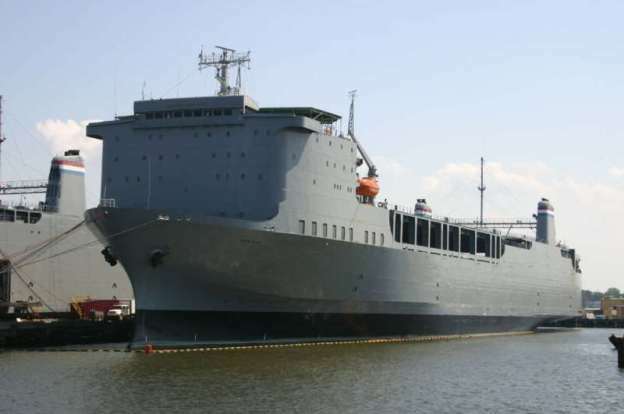 Following a transfer of the Syrian chemical weapons material at the Italian port of Gioa Tauro, the U.S. vessel–the MV Cape Ray–will neutralize the most dangerous precursor chemical using the Field Deployable Hydrolysis System under the supervision of independent OPCW inspectors. Other, less dangerous Syrian chemicals will be disposed of at industrial toxic waste disposal facilities in other countries. These operations should be completed within four months according to the OPCW. But the work of the OPCW in Syria is not yet complete. The OPCW also must clarify the whether Syria chemical weapons declaration was complete and accurate and ensure that Syria follows though on its Chemical Weapons Convention (CWC) obligation to destroy its former chemical production facilities. Unfortunately, the Assad regime now appears to be using chlorine in barrel bombs dropped from military helicopters on civilian areas. While less destructive and deadly than Sarin, these attacks are violations of the CWC and are war crimes that must end.